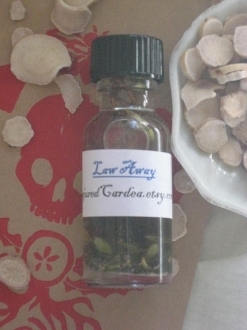 This oil will help you clear up misunderstandings and legal matters fast! Now this will help you keep police at bay so you can find a solution without looking over your shoulder. Also helps in child custody cases, avoid arrest, being served with papers, and other court cases. Stops people from giving false testimony. Great for protests! Trying to do something ethically right but illegal? Try this out! Created with high john, chewing john, black poppy seeds, fenugreek seed, deer's tongue, slippery elm and some secrets.